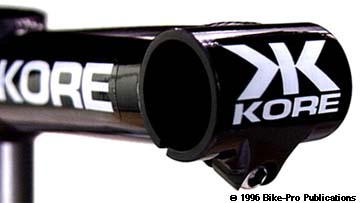 KORE has manufactured in Taiwan by Kalloy an Aheadset stem made from 6061-T6 aluminum alloy. When the on hand supply of the Taiwan models is out in the needed size small runs of the stem are made in Los Angeles, California so there is a possibility of a USA made stem. The Aheadlite uses an aluminum extrusion for the binder tube assembly, which is slightly eliptical in cross section. The narrow side of the elipse is solid, with a hole through the wide area. The narrow, solid part is what the binder fitting will be made from. The extrusion is turned on a lathe to trim away the excess aluminum around both sides of what becomes the binder fitting leaving a 10mm x 12.5mm rounded protrusion at the bottom. The protrusion is bored to recess the binder bolt head, then drilled through in a smaller diameter and tapped. A hole is drilled through the binder tube which faces into the extension tube, to relieve heat and stress when welded to the extension. The extension is made from aluminum tubing, both ends are swaged to make them ovalized in opposite directions, wider horizontally at the binder and taller vertically at the fork steerer. The vertical clamping tube is machined from seamless drawn tubing that has a wall thickness of 11.75mm (.4625"). KORE uses a CNC machine to cut away all but 3.18mm (.125") of the wall thickness on the circumferfence except a small area at the rear of the vertical clamping tube. The area of the remaining thickness is used for two clamping bolts. The thick area is drilled to recess the bolt head 13mm from each end. The Aheadlite uses three of the same bolts for both the binder and clamp. They're made of stainless steel with 6mm x 1mm pitched threads, have a 5mm hex head, are 16mm long and each weigh 5 grams. The Aheadlite is made in 1", 1 1/8" or 1 1/4" sizes. 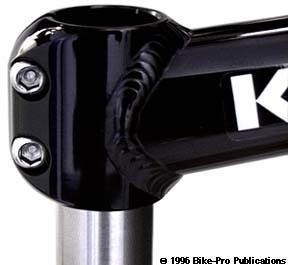 The stem comes in three lengths, 120mm, 135mm, or 150mm. All three come in a 0 degree or +10 degree rise, additionally the 120mm length comes in a +25 degree rise. The Aheadlite is after polishing is annodized Black or Clear (Silver). The 135mm long Aheadlite with a 10 degree rise weighs 172.5 grams.